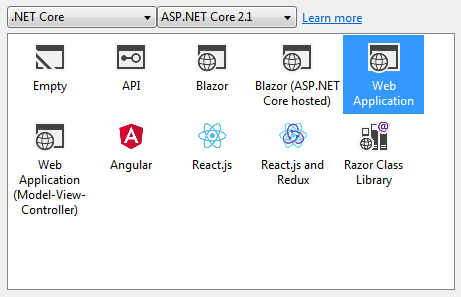 In this section, you will be shown how to use the .NET Core command line tools to create a simple Razor Pages application and how to build and run it in the browser. You will also explore the various parts of the application and understand the role that each part plays. 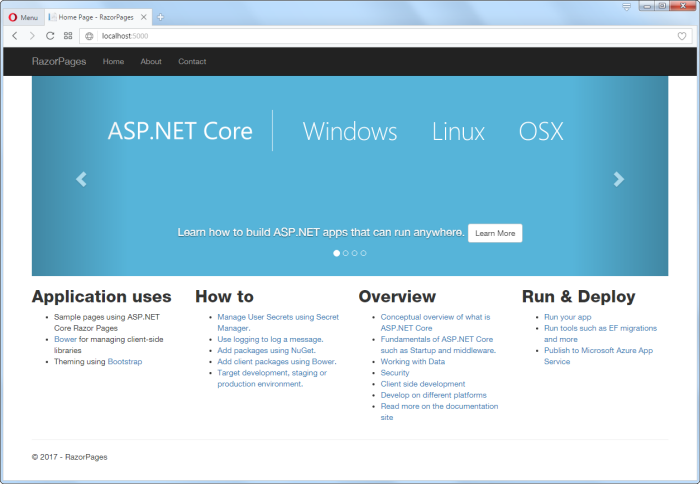 If you haven't already done so, download the latest version of the .NET Core SDK. Open your preferred command line tool (cmd.exe or Powershell in Windows; Terminal on a Mac; Bash or similar on Linux) and enter dotnet --version. 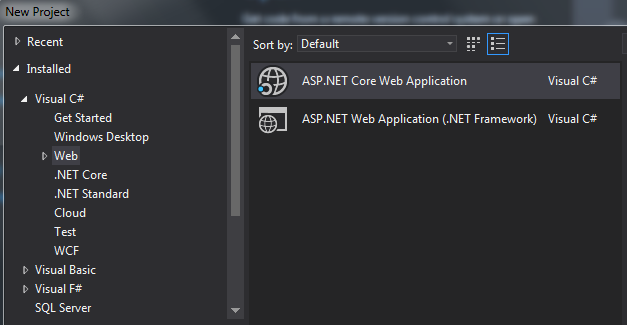 Check the output to confirm that your version of .NET Core is at least 2.0. Navigate to a suitable location for your application if needed and then type mkdir RazorPages to create a folder for your application's files. Type cd RazorPages to enter the application folder. Type dotnet new razor. This command generates the application files from the basic site template. You should receive confirmation that the site was created and that the dotnet restore command is being run. The dotnet restore command looks at the dependencies required for the application and obtains them from NuGet. Amend the file name options and the location where the project files will be created to suit your needs. This will result in a new Razor Pages application being created which should be identical to the one generated via the command line. 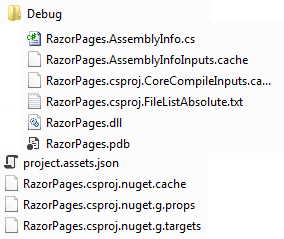 The Pages folder is the default location for Razor Pages files. The files ending with .cshtml are Razor files. 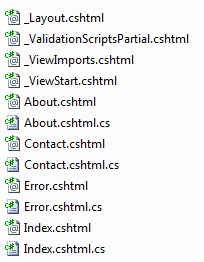 Other files, ending with .cs are C# class files. These are paired with Razor files and are known as PageModel files. Not all Razor files have a matching class file. 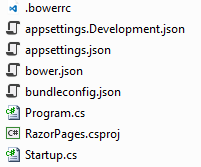 Some Razor files have a leading underscore (_) in their file name. 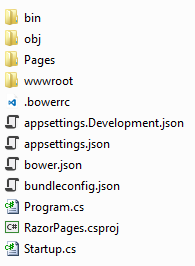 These files are not browsable, but they perform distinct roles as part of a Razor Pages application. You can read more about these special Razor files and their roles. BootStrap: a UI framework built by a team at Twitter that reduces the work required to design site layouts, and also includes a range of built-in styles for components such as bittons, forms, tables, inputs and so on. jQuery Unobtrusive Validation: another jQuery validation plugin designed by the ASP.NET team to work specifically with form inputs generated by Razor helpers. A number of files reside in the root folder. The Obj folder is used to store temporary object files and other files that are used to create the final binary during the compilation process.